Please see the invite to the following symposium on Slum Tourism at the German Geographical Society in Berlin on the 12th of February. The Annual RC21 Conference that is held in Amsterdam (The Netherlands) on July 7-9 2011 has a session aimed particularly at “Slums, Ghettoes, and the Internal Periphery of the Global Urban“. This session appears to be an interesting opportunity for the slum tourism community to present and discuss their work. The deadline for abstract submission is December 21st, 2010. If you also know of a potentially interesting conference, please post it on this website or contact us using the contact form or via e-mail: conference@slumtourism.net. The international conference on slum tourism that was held in Bristol from 9-11 December was a great success. Delegates from 6 continents discussed a wide variety of subjects dealing with tourism in slums around the world. The conference started with an interesting and entertaining discussion of tourism in the favelas by keynote speaker Bianca Freire Medeiros. Following this, 24 other presentations were given that sparked off great discussions not only directly following the presentation, but also during coffee breaks and the evening programme. To all that came, thank you very much for your input. Let’s hope we can follow up on the momentum of this conference to increase research and insights regarding slum tourism so that a follow up conference can be organised soon! In the meantime the RC21 conference in Amsterdam may be a next meeting point for those doing research on tourism in slum areas. The conference Destinationa Slum! 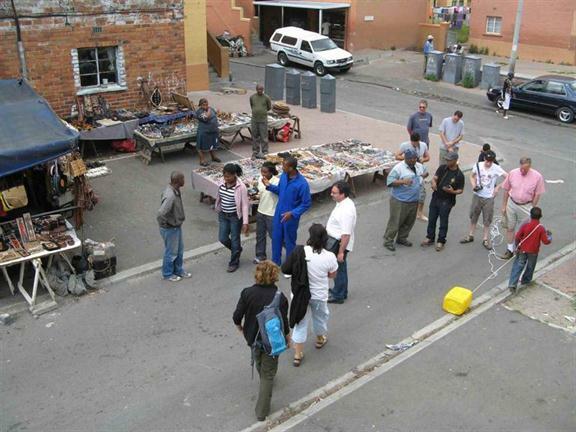 which is organised in Bristol,UK 9-11 December and aims to bring together researchers of slum and poverty tourism in urban areas, is shaping up to be an exciting event. Over 20 proposals of papers have been accepted and will be presented. More information about the conference can be found on its website. For those wishing to attend, the deadline for the call for papers has now passed but it is still possible to attend the conference without presenting. The cost of attendance is £ 50.00 for graduate students or independent researchers without full employment and £ 100.00 for full academic researchers and researchers in full employment. To secure a place people can register here and pay the fee here (fees are paid through the University of the West of England). Slums (that includes favelas, townships and other notations as well) have long enticed popular imagination. They have been scandalised and fought, bulldozed down and walled in. Equally however they were idealised and sought out as places displaying a more authentic humanity, flourishing culture and deviant, but inventive entrepreneurship. Not just the recent fascination with films like “City of God” and “Slum Dog Millionaire” shows that these desires have all but vanished. Indeed in today’s ‘planet of slums’, slum-tourism flourishes. Concurrently the concept of slum tourism is problematised in a growing body of research that addresses this controversial past time. Is slum tourism voyeuristic and immoral? How are guided tours organized or composed? What is and why is it shown? To what extent can it provide an income and positive visibility for people in deprived areas? What motivations and expectations did and do people have to visit slums? Why and to what extend are slum tours considered to be ‘authentic’ forms of holidays? Which stakeholders are involved in slum tourism and who profits most? How does today’s slum-tourism relate to its historic predecessors and to the legacy of colonialism? What are the geographical scopes of slum-tourism and which place does it occupy in the new mobility system? Where does slum tourism fit in a globalised world of tourist consumption? What is the relationship between slum tourism and issues of migration, democracy and (in)equality? An increasing number of scholars are working on these issues on different continents. This conference aims to bring together researchers of slum and poverty tourism in urban areas, in order to stimulate an exchange of experiences and contacts. Working towards the formation of an international network of researchers the conference will also aim to be stepping stone for further co-operations and projects on the subject. Keynote speaker: Dr. Bianca Freire-Medeiros, author of Touring Poverty (Routledge, 2011). The geographies of slum tourism. Theoretical, methodological and ethical issues in Slum Tourism Research. Researchers from across all disciplines are invited to submit paper proposals. They should include the title of the paper, a short abstract (max. 300 words), institutional affiliation and contact information. The conference will take place at the University of the West of England in Bristol, UK. The fees for the 3-day event are 100 Pound Sterling (50 Pound for Graduate Students), covering conference materials, refreshments, lunch and two dinners. More information will be available on www.destinationslum.com. Proposals should be send before September 1, 2010 to Dr. Fabian Frenzel (fabian.frenzel@uwe.ac.uk). Accepted presentations are invited to submit full papers by 15th November 2010 to be considered for publication in a special issue of an international journal (Negotiations are under way). We look forward to hearing from you. Intercultural Studies), University of Osnabrueck.